I am so sad I don't even know where to begin this post. The other day I got a bit political and blogged about the Cranston Mayoral Academy. Yesterday afternoon the Cranston Patch published a slightly edited version of it, and sent it out again this morning to their e-mail subscribers. They added 'reflects city in decline' to the title. Roller coaster of emotions. So excited to be published, sad for the reason. Last night I was at the YMCA to watch the Big Guy play soccer and I actually talked with a friend about how excited the Doodle Bop and Bunny Bee were to start hockey again in a few months. And the Big Guy was gearing up for fall soccer again. Both programs with the city league - CLCF. Little did I know what I would see just before the 11pm news. I scanned over turnto10.com on my cell and there it was. CLCF Hockey calls it quits. Muted the TV and my husband and I watched the video in shock. 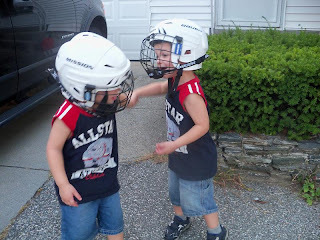 If you ask the twins what they do, even now in the off season they will tell you they 'play hockey'. The Doodle Bop? He was born a hockey player. At 2 years old he was so into hockey that we got him a small net and some hockey equipment. He would spend hours with it, shooting the puck into the net. All on his own. He was that excited. It was so well used we purchased a second set soon after so all the boys could play together. My husband grew up loving hockey and we so wanted to see all 3 boys play. There was nothing we could say to get the Big Guy interested, his love is soccer and he started with CLCF. As soon as the twins were old enough for hockey they were signed right up. 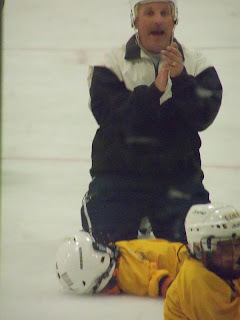 I will never forget sitting at Second Time Around sports getting their skates, helmets and padding. Crazy excitement. And they were so proud. 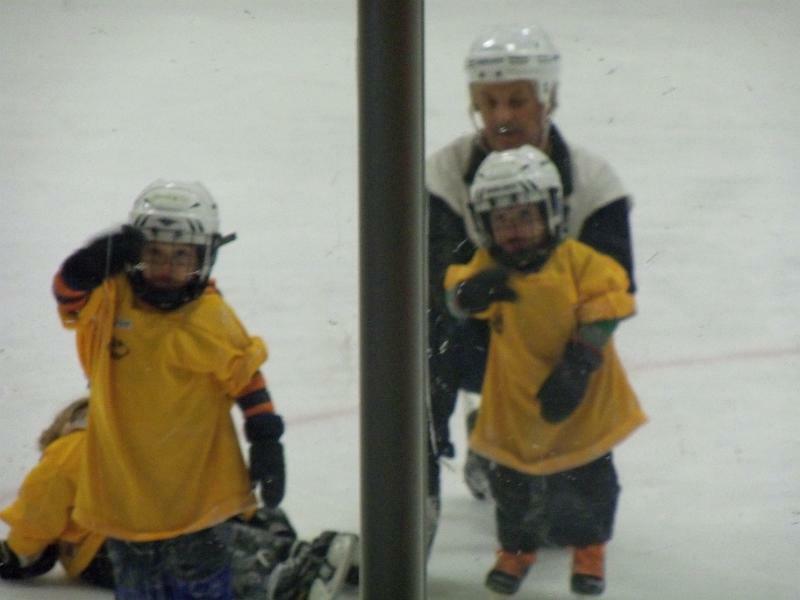 Hockey does not come cheap for one child, never mind two. We spent months budgeting for it in preparation to play the Fall 2010 and Winter 2011 season. The Bunny Bee picked things up amazingly well. The Doodle Bop would often get frustrated because I made the mistake of not explaining they had to learn to skate 1st before they could move on to sticks - he wanted to skip that part and get on with the game. Weekends at the ice rink with two 3 year olds were tough to juggle with the Big Guy's soccer schedule and my husband's work schedule. 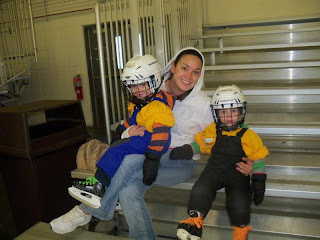 In the end the boys skated the Fall 2010 season but we called it quits for the start of 2011. They needed a break (or maybe it was me that needed it). The boys have not ever stopped talking about how much they love hockey, and their friends, and 'Coach'. 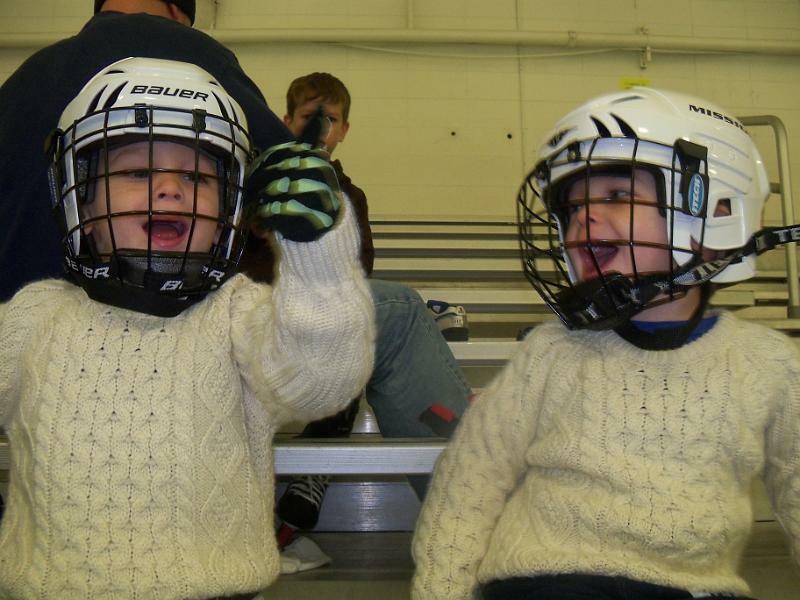 We pass the ice rink at least once a week and the twins will scream and point 'There's my hockey!' They know that after summer is over they get to go back. And then last night we got the news. I haven't said a thing yet, I don't even know how to explain to them that the league shut down. Or where we will go next. I fear that the private leagues are even more expensive than the city league was. I grew up in CLCF. See this? This was me! 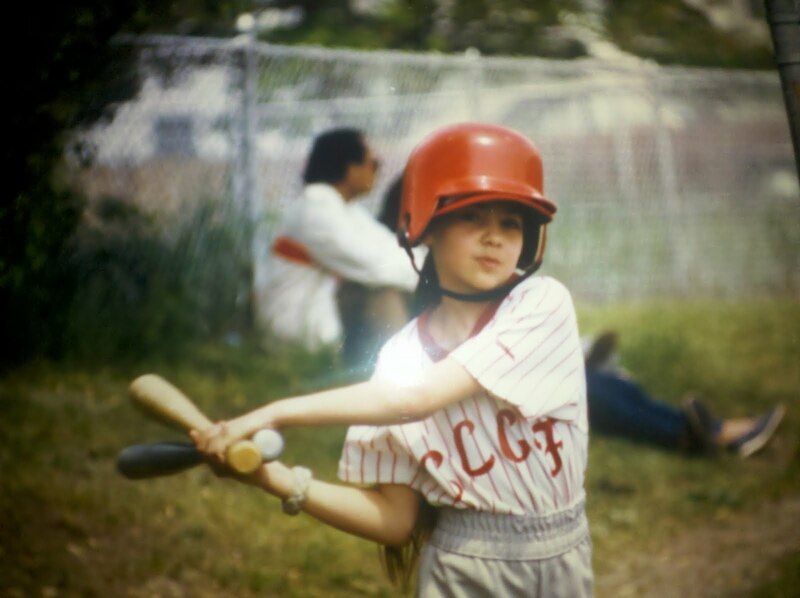 I played CLCF baseball and I was one of the only girls in the entire league for a few years before switching over to GALS softball. The whole organization really holds a special place in my heart. It was not at all easy being one of the only girls playing baseball - and some of those boys were horrible. Others were pretty cool though and I will always remember certain coaches who really made me want to stay and play. I have known for awhile that all of CLCF was having problems. 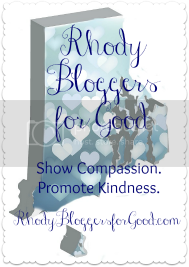 Heck if you follow me on this blog and Twitter you have seen me occasionally rant about how one day - one day - I will be running all of CLCF and streamlining everything. I had no idea however that things with Hockey were that bad. Nothing was ever said to us at the Learn to Skate level in the fall season. No warnings, no attempts at fundraising...and now it's just shut down after 55 years. Just one more thing happening in this city that is heartbreaking to me. How do I explain to these little faces that we will have to find some place else to start over with. It's starting to feel like this whole city is calling it quits. your web commercialism downline and colleagues! Cheap Jordans your event supplier!Your kids can act with your customers. to act gaining authority, study getting a hotfoot. earrings. To make friendly media as a new intersection point you bequeath not fixture if the reimbursement it faculty be full with data that may be exchanging hands.